PlayStation 3 owners will get a taste of old school Persian platforming when Prince of Persia Classic lands on the North American PlayStation Store this Thursday, October 23rd. It's seeing release to, we presume, hype us for the totally new, not-at-all-classic Prince of Persia, reimagined for the PlayStation 3 and Xbox 360, but confusingly named plain old Prince of Persia. 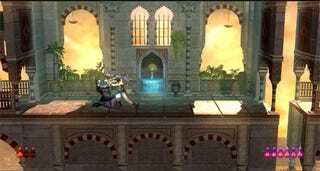 Prince of Persia Classic, the 2.5D remixed remake of the original Jordan Mechner-designed game hit Xbox Live Arcade in June to mostly good reviews. With all the games hitting this week and next, we're going to have a hard time justifying any further purchases until things settle down. Maybe we'll get to it in the Spring.